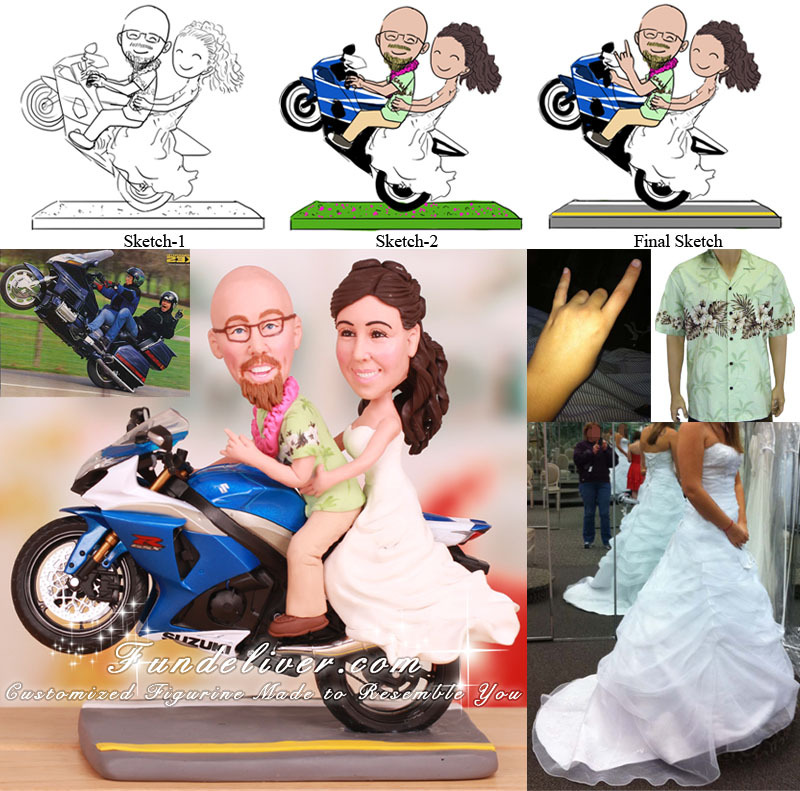 This is a completely customized couple doing wheelie wedding cake topper ordered by one of our customers. The bike they would like is a blue and white Suzuki GXSR and they would like their figurine to be doing a wheelie with both groom and bride on the bike head to the side. The groom loves riding bikes, their garage is full of them. He does wheelies all the time and when the bride rides with him he'll do wheelies with her on the back...The bride can't do wheelies that's why she wanted both of them on the bike doing a wheelie. Their wedding colors are green and purple and the bride is wearing a white strapless wedding dress. She has medium length hair wearing down. It’s brown and wavy. The groom is bald but has a blond goatee. He is wearing khaki pants with a green Hawaiian shirt and purple lei. Also they would like the groom to be holding up the devil horns with one hand. No matter what kind of wheelie you want, we can make it for you. 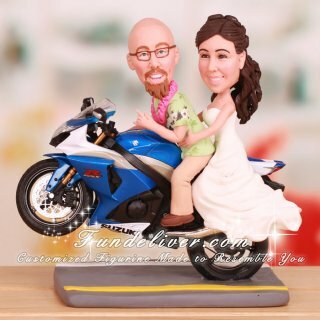 Please refer to the following two wheelie cake toppers, couple do standing wheelies motorcycle cake topper and groom doing wheelie on motorcycle cake topper. Hope these can bring your some inspirations to make your own doing wheelie wedding cake toppers.